The nuclear-tipped bunker-busters would be used only if a conventional attack was ruled out and if the United States declined to intervene, senior sources said. “Two Israeli air force squadrons are training to blow up an Iranian facility using low-yield nuclear “bunker-busters”, according to several Israeli military sources. For two years, the Western media has remained notoriously silent on what has already been known and documented, namely the threat of a US-Israeli sponsored nuclear holocaust. The anti-war movement has failed to address it. This belated report by the London Times confirms what the media has ommitted from its reports in the course of the last two years. The release of this information at this particular juncture could also serve to galvanize the support of public opinion in favour of a first US-Israeli strike nuclear attack on Iran. It is abosulteley essential that people around the World act decisively to prevent the use of nukes against Iran. We bring to the consideration of our readers the following text by Michel Chossudovsky, published in May 2005, which contains a Timeline of military planning and details on weapons systems to be used in the case of an attack on Iran, using both conventional and nuclear weapons. Moreover, US military action on Iran not only threatens Russian and Chinese interests, which have geopolitical interests in the Caspian sea basin and which have bilateral agreements with Iran. It also backlashes on European oil interests in Iran and is likely to produce major divisions between Western allies, between the US and its European partners as well as within the European Union. Through its participation in NATO, Europe, despite its reluctance, would be brought into the Iran operation. The participation of NATO largely hinges on a military cooperation agreement reached between NATO and Israel. This agreement would bind NATO to defend Israel against Syria and Iran. NATO would therefore support a preemptive attack on Iran’s nuclear facilities, and could take on a more active role if Iran were to retaliate following US-Israeli air strikes. 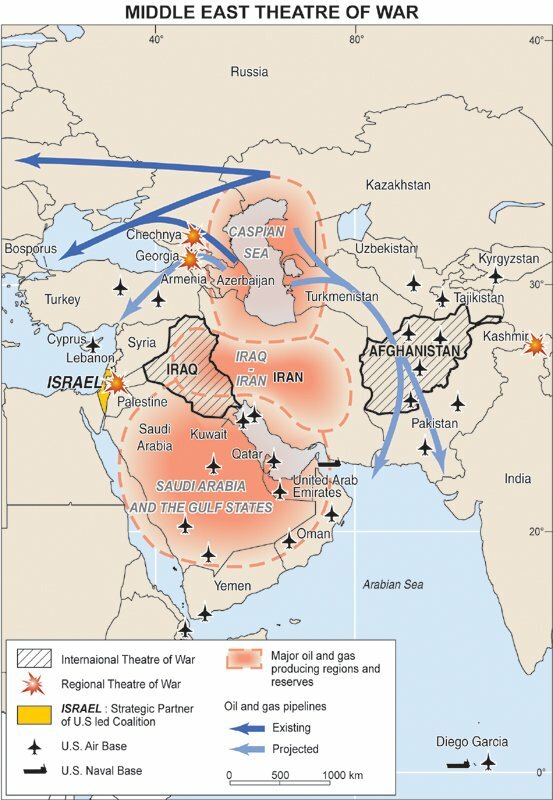 Needless to say, the war against Iran is part of a longer term US military agenda which seeks to militarize the entire Caspian sea basin, eventually leading to the destabilization and conquest of the Russian Federation. Under this working arrangement, Israel will not act unilaterally, without a green light from Washington. In other words, Israel will not implement an attack without the participation of the US. Meanwhile, for the last two years, Washington has been involved in covert intelligence operations inside Iran. American and British intelligence and special forces (working with their Israeli counterparts) are involved in this operation. The expectation is that a US-Israeli bombing raid of Iran’s nuclear facilities will stir up ethnic tensions and trigger “regime change” in favor of the US. (See Arab Monitor, http://www.globalresearch.ca/articles/ARA502A.html ). Bush advisers believe that the “Iranian opposition movement” will unseat the Mullahs. This assessment constitutes a gross misjudgment of social forces inside Iran. What is more likely to occur is that Iranians will consistently rally behind a wartime government against foreign aggression. In fact, the entire Middle East and beyond would rise up against US interventionism. Tehran has confirmed that it will retaliate if attacked, in the form of ballistic missile strikes directed against Israel (CNN, 8 Feb 2005). These attacks, could also target US military facilities in the Persian Gulf, which would immediately lead us into a scenario of military escalation and all out war. In other words, the air strikes against Iran could contribute to unleashing a war in the broader Middle East Central Asian region. Moreover, the planned attack on Iran should also be understood in relation to the timely withdrawal of Syrian troops from Lebanon, which has opened up a new space, for the deployment of Israeli forces. The participation of Turkey in the US-Israeli military operation is also a factor, following an agreement reached between Ankara and Tel Aviv. In other words, US and Israeli military planners must carefully weigh the far-reaching implications of their actions. A massive buildup in military hardware has occurred in preparation for a possible attack on Iran. Bear in mind that the bunker buster bombs can also be used to deliver tactical nuclear bombs. The B61-11 is the “nuclear version” of the “conventional” BLU 113. It can be delivered in much same way as the conventional bunker buster bomb. (See Michel Chossudovsky, http://www.globalresearch.ca/articles/CHO112C.html , see also http://www.thebulletin.org/article_nn.php?art_ofn=jf03norris ) . Moreover, while most reports have centered on the issue of punitive air strikes on Iran’s nuclear facilities, the strikes would most probably extend to other targets. “We are not going to get in a ground war in Iran, I hope. If we get into that, we are in serious trouble. I don’t think anyone in Washington is seriously considering that.” ( quoted in the National Journal, 4 December 2004). Despite its overall weaknesses in relation to Israel and the US, Iran has an advanced air defense system, deployed to protect its nuclear sites; “they are dispersed and underground making potential air strikes difficult and without any guarantees of success.” (Jerusalem Post, 20 April 2005). It has upgraded its Shahab-3 missile, which can reach targets in Israel. Iran’s armed forces have recently conducted high-profile military exercises in anticipation of a US led attack. Iran also possesses some 12 X-55 strategic cruise missiles, produced by the Ukraine. Iran’s air defense systems is said to feature Russian SA-2, SA-5, SA-6 as well as shoulder-launched SA-7 missiles (Jaffa Center for Strategic Studies). While the US, Israel, as well as Turkey (with borders with both Iran and Syria) are the main actors in this process, a number of other countries, in the region, allies of the US, including several Central Asian former Soviet republics have been enlisted. Britain is closely involved despite its official denials at the diplomatic level. Turkey occupies a central role in the Iran operation. It has an extensive military cooperation agreement with Israel. There are indications that NATO is also formally involved in the context of an Israel-NATO agreement reached in November 2004. According to former weapons inspector Scott Ritter, George W. Bush has already signed off on orders for an aerial attack on Iran, scheduled for June. The June cut-off date should be understood. It does not signify that the attack will occur in June. What it suggests is that the US and Israel are “in a state of readiness” and are prepared to launch an attack by June or at a later date. In other words, the decision to launch the attack has not been made. 1) several high profile military exercises have been conducted in recent months, involving military deployment and the testing of weapons systems. 2) military planning meetings have been held between the various parties involved. There has been a shuttle of military and government officials between Washington, Tel Aviv and Ankara. 3) A significant change in the military command structure in Israel has occurred, with the appointment of a new Chief of Staff. 4) Intense diplomatic exchanges have been carried out at the international level with a view to securing areas of military cooperation and/or support for a US-Israeli led military operation directed against Iran. 5) Ongoing intelligence operations inside Iran have been stepped up. 6) Consensus Building: Media propaganda on the need to intervene in Iran has been stepped up, with daily reports on how Iran constitutes a threat to peace and global security. November 2004 in Brussels: NATO-Israel protocol: Israel’s IDF delegation to the NATO conference to met with military brass of six members of the Mediterranean basin nations, including Egypt, Jordan, Algeria, Tunisia, Morocco, Algeria and Mauritania. “NATO seeks to revive the framework, known as the Mediterranean Dialogue program, which would include Israel. The Israeli delegation accepted to participate in military exercises and “anti-terror maneuvers” together with several Arab countries. January 2005: the US, Israel and Turkey held military exercises in the Eastern Mediterranean , off the coast of Syria. These exercises, which have been held in previous years were described as routine. February 2005. Following the decision reached in Brussels in November 2004, Israel was involved for the first time in military exercises with NATO, which also included several Arab countries. February 2005: Assassination of former Lebanese Prime Minister Rafik Hariri. The assassination, which was blamed on Syria, serves Israeli and US interests and was used as a pretext to demand the withdrawal of Syrian troops from Lebanon. The Israel-NATO protocol is all the more important because it obligates NATO to align itself with the US-Israeli plan to bomb Iran, as an act of self defense on the part of Israel. It also means that NATO is also involved in the process of military consultations relating to the planned aerial bombing of Iran. It is of course related to the bilateral military cooperation agreement between Israel and Turkey and the likelihood that part of the military operation will be launched from Turkey, which is a member of NATO. March-April 2005: The Holding in Israel of Joint US-Israeli military exercises specifically pertaining to the launching of Patriot missiles. US Patriot missile crews stationed in Germany were sent to Israel to participate in the joint Juniper Cobra exercise with the Israeli military. The exercise was described as routine and “unconnected to events in the Middle East”: “As always, we are interested in implementing lessons learned from training exercises.” (UPI, 9 March 2005). In Baku, Azerbaijan Rumsfeld was busy discussing the date for deployment of US troops in Azerbaijan on Iran’s North-Western border. US military bases described as “mobile groups” in Azerbaijan are slated to play a role in a military operation directed against Iran. Azerbaijan is a member of GUUAM, a military cooperation agreement with the US and NATO, which allows for the stationing of US troops in several of the member countries, including Georgia, Uzbekistan and Azerbaijan. The stated short term objective is to “neutralize Iran”. The longer term objective under the Pentagon’s “Caspian Plan” is to exert military and economic control over the entire Caspian sea basin, with a view to ensuring US authority over oil reserves and pipeline corridors. Rumsfeld’s visit followed shortly after that of Iranian President Mohammad Khatami’s to Baku. April 2005: Iran signs a military cooperation with Tajikistan, which occupies a strategic position bordering Afghanistan’s Northern frontier. Tajikistan is a member of “The Shanghai Five” military cooperation group, which also includes Kazakhstan, China, Kyrgyzstan, and Russia. Iran also has economic cooperation agreements with Turkmenistan. Mid April 2005: Israel Prime Minister Ariel Sharon meets George W Bush at his Texas Ranch. Iran is on the agenda of bilateral talks. More significantly, the visit of Ariel Sharon was used to carry out high level talks between US and Israeli military planners pertaining to Iran. Late April 2005. President Vladmir Putin is in Israel on an official visit. He announces Russia’s decision to sell short-range anti-aircraft missiles to Syria and to continue supporting Iran’s nuclear industry. Beneath the gilded surface of international diplomacy, Putin’s timely visit to Israel must be interpreted as “a signal to Israel” regarding its planned aerial attack on Iran. The sale pertains to the larger and more sophisticated “Guided Bomb Unit-28 (GBU-28) BLU-113 Penetrator” (including the WGU-36A/B guidance control unit and support equipment). The GBU-28 is described as “a special weapon for penetrating hardened command centers located deep underground. The fact of the matter is that the GBU-28 is among the World’s most deadly “conventional” weapons used in the 2003 invasion of Iraq, capable of causing thousands of civilian deaths through massive explosions. Late April 2005- early May: Turkey’s Prime Minister Recep Tayyip Erdogan in Israel for follow-up talks with Ariel Sharon. He was accompanied by his Defense Minister Vecdi Gonul, who met with senior Israeli military officials. On the official agenda of these talks: joint defense projects, including the joint production of Arrow II Theater Missile Defense and Popeye II missiles. 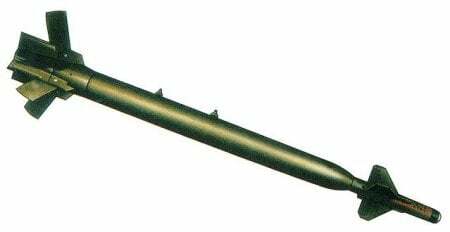 The latter also known as the Have Lite, are advanced small missiles, designed for deployment on fighter planes. Tel Aviv and Ankara decide to establish a hotline to share intelligence. May 2005: Syrian troops scheduled to withdraw from Lebanon, leading to a major shift in the Middle East security situation, in favor of Israel and the US. The US has troops and military bases in Turkey, Pakistan, Azerbaijan, Afghanistan, and of course Iraq. In other words, Iran is virtually surrounded by US military bases. (see Map below). These countries as well as Turkmenistan, are members of NATO`s partnership for Peace Program. and have military cooperation agreements with NATO. “since Iranian nuclear objects are scattered all over the country, Israel will need a mass strike with different fly-in and fly-out approaches – Jordan, Iraq, Turkey, Azerbaijan, and other countries… Azerbaijan seriously fears Tehran’s reaction should Baku issue a permit to Israeli aircraft to overfly its territory.” (Defense and Security Russia, 12 April 2005). The antiwar movement must act, consistently, to prevent the next phase of this war from happening. This is no easy matter. The holding of large antiwar rallies will not in itself reverse the tide of war. What is required is a grass roots network, a mass movement at national and international levels, which challenges the legitimacy of the military and political actors, and which is ultimately instrumental in unseating those who rule in our name. Antiwar sentiment does not dismantle a war agenda. The war criminals in the US, Israel and Britain must be removed from high office. What is needed is to reveal the true face of the American Empire and the underlying criminalization of US foreign policy, which uses the “war on terrorism” and the threat of Al Qaeda to galvanize public opinion in support of a global war agenda. With between 200 and 500 thermonuclear weapons and a sophisticated delivery system, Israel has quietly supplanted Britain as the World’s 5th Largest nuclear power, and may currently rival France and China in the size and sophistication of its nuclear arsenal. Although dwarfed by the nuclear arsenals of the U.S. and Russia, each possessing over 10,000 nuclear weapons, Israel nonetheless is a major nuclear power, and should be publicly recognized as such. Second, it would expose the grotesque double standard which sees the U.S. and Europe on the one hand condemning Iraq, Iran and Syria for developing weapons of mass destruction, while simultaneously protecting and enabling the principal culprit. Third, exposing Israel’s nuclear strategy would focus international public attention, resulting in increased pressure to dismantle its weapons of mass destruction and negotiate a just peace in good faith. Finally, a nuclear free Israel would make a Nuclear Free Middle East and a comprehensive regional peace agreement much more likely. Unless and until the world community confronts Israel over its covert nuclear program it is unlikely that there will be any meaningful resolution of the Israeli/Arab conflict, a fact that Israel may be counting on as the Sharon era dawns.